Anyone else have a hard to handle three-year-old? My youngest son this last week has been given new meaning to being a toddler. He is in the middle of a growth spurt and when he isn't eating he is having a complete melt down. Shopping with him in tow has become impossible and I am beginning to want to have a temper tantrum myself. The thing that has saved my sanity is cooking and baking. Cooking has always been my lifeline. As a teenager when everything was crazy in my life cooking was my way to relax and stay grounded. To this day it has the same effect on my well-being. I love to cook and bake and they are a great way for me to feel as if I am doing something worthwhile for my family. Recently, I tried a new recipe for Pork and Green Chile Stew from the September issue of Food and Wine magazine, which looked filling and delicious. This recipe has 10 ingredients. It takes a total of 45 minutes, 25 minutes of which is active and makes 6 servings. I had to go to multiple stores to find all the peppers needed, but that is normal for my area. I ended up buying Anaheim peppers, since I could not find decent poblanos. Since I was cooking for my kids I seeded all my serrano chiles, my kids can be pretty picky when it comes to spiciness. As I always try to do I served brown rice instead of white. I prefer using brown rice almost exclusively. In order for the stew to thicken completely I allowed it to cook for 50 minutes, instead of the 20 suggested by the recipe. I followed the remainder of the recipe as written. I really enjoyed this recipe. Over rice it is delicious, but it was also great heated up in a bowl and eaten more like a traditional stew the next day. The flavors from the chiles were delicious, I loved how rich the stew turned out and the pork literally melted in my mouth. My two kids loved the pork and picked it out of the peppers, which is normal for them. Overall, a great chile stew recipe that I would make again in the future. 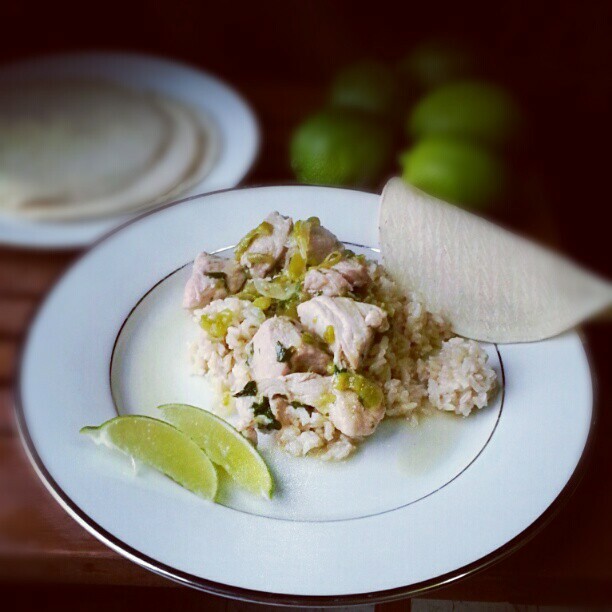 For the recipe go to Pork and Green Chile Stew. Thanks for the new idea. We love peppers and spiciness. I've always thought of peppers as part of a stew not the "title" of the stew. You've opened my eyes! As always - I love the practical tips you include that help me when I'm actually working with a recipe. Thanks for the mention on your blog and all your great comments :) These stew really is delicious!